There are 10 snacks in each category, all that are Keto friendly. Most are available via Amazon Prime, too. And if you’re practicing Keto, be sure to check out our Keto friendly recipes, too. 1 Tom & Jenny’s Sugar Free Caramels – These do have Maltitol, which some people don’t tolerate well. 2 Fat Snax Low Carb Cookies – This variety pack has Chocolate Chip, Lemony Lemon, and Peanut Butter, so you’re less likely to get bored. 3 Quest Nutrition Chocolate Chocolate Chip Cookies – These are gluten and soy free, too. 4 Nush Low Carb Snack Cakes – The variety pack includes flavors like Carrot Spice, Blueberry, and Mango Pineapple. 5 Stoka Bars – These are Paleo friendly, Vegan, and come really highly rated! They’re great for athletes and active types too. Not just a keto friendly snack. 6 KetoBrownie Blondie Brownies – Who doesn’t love a great blondie?!?! 7 Shrewd Food Strawberries & Cream Protein Crisps – These satisfy that sweet-crunchy thing. 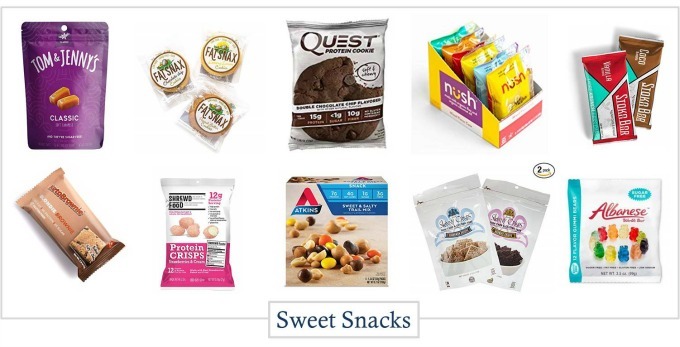 8 Atkins Sweet & Salty Trail Mix – Waitaminit…You can get peanut butter candies and caramel on Keto? Heck yeah! 9 Skinny Crisps – They’re like a sweet cracker, or a healthier version of Brownie Brittle. 10 Sugar Free Gummy Bears – I know we’ve all heard the nightmare stories about sugar free gummies. These don’t have that issue. 1 Shrewd Food Brick Oven Pizza Crisps – These satisfy so many cravings. 2 Basil Pesto Parm Crisps – These are made from actual Parmesan cheese, just like you’d do at home. 3 Pizza in a Bag Pepperoni Jerky – It’s jerky that tastes like pizza?? WHAAA??? 4 Nick’s Sticks Grass Fed Beef Snack Sticks – These are great not just for Keto or Paleo, but for anyone concerned about processed foods. 5 HighKey Snacks Cheese & Egg Crisps – These are kinda like crackers, kinda like the cheese crisps you make at home. They’re sooo good. 7 Bunker Hill Cheese Crisps – This set has Swiss cheese, which is one of my fffaaavvvveeeessss!!! You don’t usually see it in premade items. 8 Blue Diamond Salt and Vinegar Almonds – My mouth is watering just thinking about this. 9 Pearls Olives to Go – Olives are a great keto friendly snack, and a great add in to salads. 10 Jack Links Beef Jerky Variety Pack – These teriyaki nuggets are so yum!! 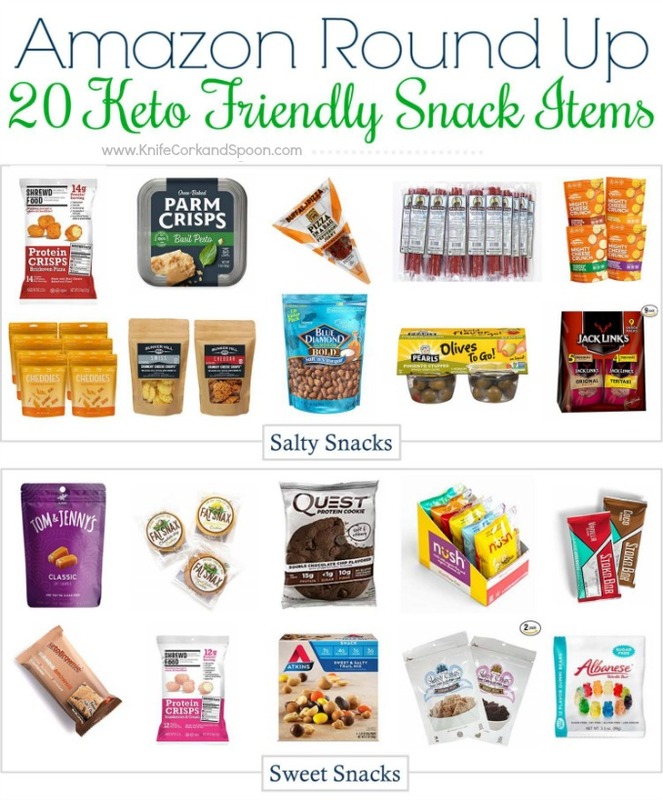 There you have it – 20 fantastic Keto friendly snacks that are available on Amazon. 10 sweet, 10 salty, all delicious. They’re great for bringing with you when you’re out and about, or for convenience.